Wrap yourself in the warmth of Ireland. 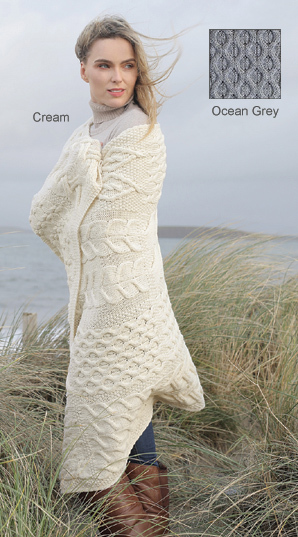 On the beach or on the sofa, this throw of super-soft merino wool in traditional Aran knit surrounds you with the cozy comfort of an Irish welcome. 42" x 64". 100% merino wool; hand wash or dry clean. Made in Ireland. In Cream or Ocean Grey. It is a wonderful shawl. I like the generous size and it is so warm. My three year old grandson decided he wants it to be his blanket. The craftmanship is beautiful. Bought this to gift it. It was both beautiful and wonderfully soft. I wanted to keep it of course.